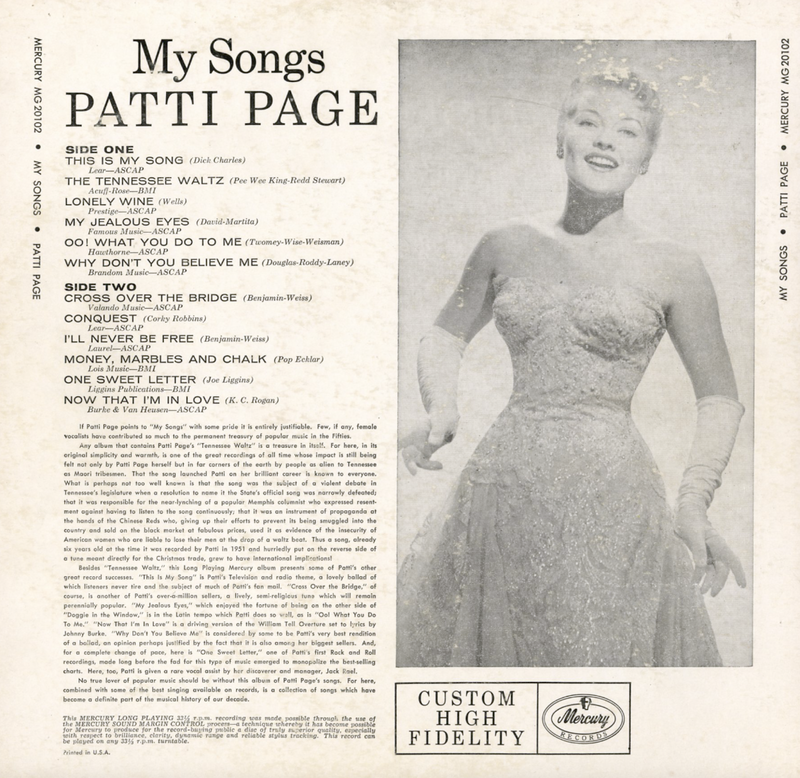 From the back cover: Any album that contains Patti Page's "Tennessee Waltz" is a treasure in itself. 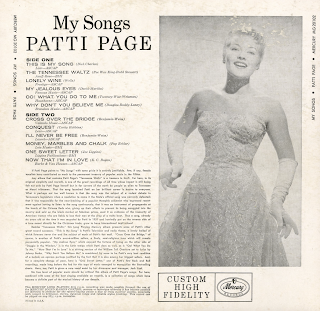 For here, in its original simplicity and warmth, is one of the great recordings of all time whose impact in still felt not only by Patti Page herself but in far corners of the earth by people as alien to Tennessee as Maori Tribesmens. 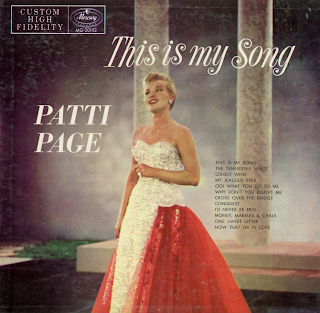 That the song launched Patti on her brilliant career is known to everyone. What is perhaps not too well known is that the song was the subject of a violent debate in Tennessee's legislature when a resolution to name it the State official song was narrowly defeated; that it was responsible for the near-lynching of a popular Memphis columnist who expressed resentment against having to listen to the song continuously; that it was an instrumental of propaganda at the hands of the Chinese Reds who, giving up their efforts to prevent its being smuggled into the country and sold on the black market at fabulous prices, used it as evidence of the insecurity of American women who are liable to lose their men at the drop of a waltz beat. 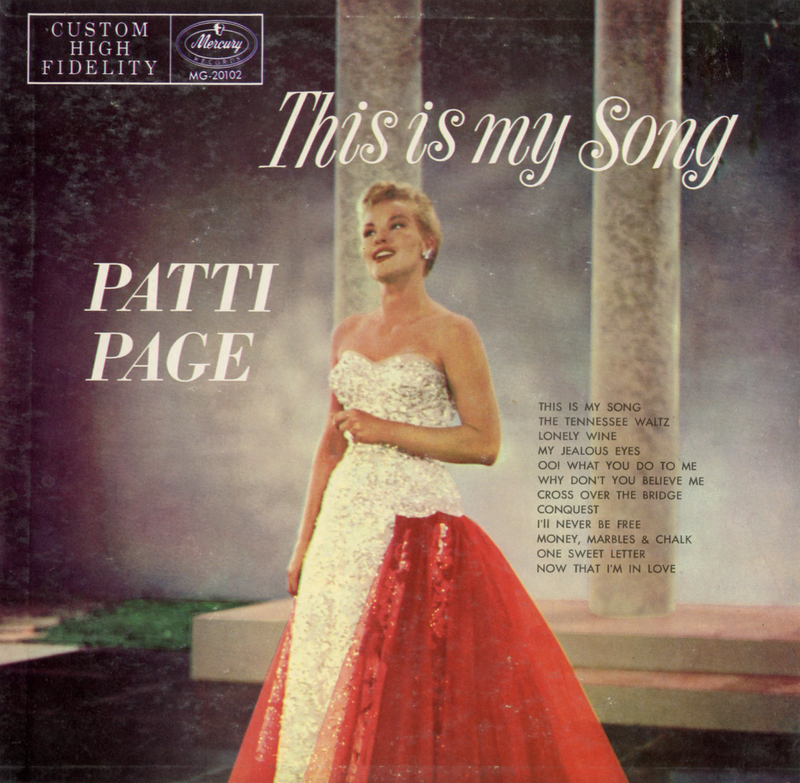 Thus a song, already six years old at the time it was recorded by Patti in 1951 and hurriedly put on the reverse side of a tune meant directly for the Christmas trade, grew to have international implications!